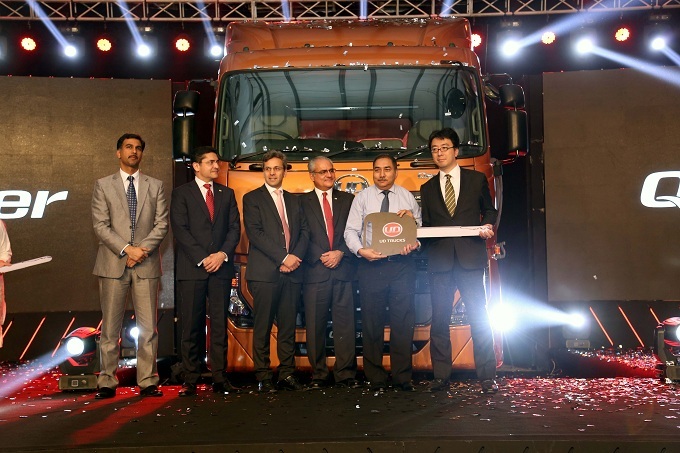 UD Trucks Corporation, together with VPL Limited, the authorized distributor of UD Trucks in Pakistan, today launched the all-new UD Quester heavy-duty truck range in Pakistan. 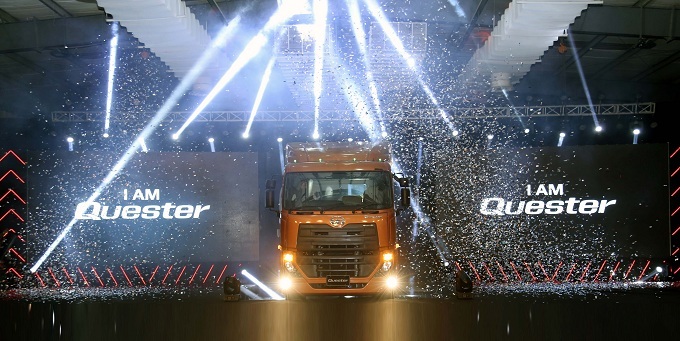 The UD Trucks Quester range was launched on the 29th of June at an impressive ceremony held at Expo Centre, Karachi. The unveiling of Quester created hype among the audience who were eagerly waiting for its launch since its announcement early this year. Among the audience were guests from the Japanese Embassy, Oil & Gas Regulatory Authority, National Highway Authority, leading transporters, banks and senior management of UD Trucks and VPL. Quester is the first in a new generation of UD Trucks specifically developed for the world of heavy-duty transportation outside of Japan. It benefits from Japanese quality heritage and insights from the local markets. It is developed with the global resources of the Volvo Group of which UD Trucks is a part. It makes customers working day simpler and more productive. Quester provides complete solution for long haulage, distribution, construction and mining segments. This is backed up by a wide range of configuration with easy body mounting offering a tailored, purpose-built solution for all type of applications. Quester is the optimum transport solution for businesses that wants to grow. Quester is UD Trucks’s most cost-efficient truck ever. It’s wide driveline options, the ability to optimize the powertrain with respect to power output, transmissions and rear axle ratios, minimized aerodynamic drag that decreases the wind resistance, long oil change intervals and fuel coaching system help in cutting fuel costs and maximizing uptime, resulting in quick and dependable payback. Quester has wide range of different product types such as 4X2T, 6X2T, 6X4T for long haul, 6X4R long chassis for regional distribution, 6X4 and 8X4 tippers for heavy duty construction and mining applications. The 6X2T and 6X2R configurations are available with a bogie lifting axle which is used to lift the axle in the unladen condition. The lifting function on the third axle gives the truck better traction when activated. It also gives better fuel consumption, extended tyre life and a smaller turning radius. It can be supplied with bogie press which is used when higher traction is required. Quester features and specifications comply 100% to OGRA and NHA safety regulations. Quester is available with factory fitted ADR package as an option. The ADR package includes a battery safety switch and insulated terminal and lamps. Commenting from the launch, Mourad Hedna UD trucks President in the MEENA region: “We are very excited about the arrival of the Quester range in Pakistan. With the new Quester, we have now built on our tradition of reliability and durability, to launch our new customer promise, ‘going the extra mile’. “I am confident that Quester will be a big game-changer for UD Trucks and VPL, our partner in Pakistan. More than 400 full-time experts from around the world, with extensive knowledge and ‎experience, have been involved in designing, developing and validating ‎Quester and its associated services”. The team has spent over a million engineering hours and ‎‎65,000 tests hours to build the ultimate trucking machine’’. UD Trucks is a transport solution provider expert in fuel efficiency and uptime, offering a range of medium and heavy-duty trucks, and special vehicles. As one of the leading Japanese truck brands, UD Trucks was established in Japan in 1935, and in 2007 became part of the Volvo Group, a world-leading manufacturer of trucks, buses and construction equipment, and drive systems for marine and industrial applications. Nowadays, UD Trucks, with its headquarters in Japan, conducts sales and services in more than 64 countries through a worldwide network of over 233 dealers. VPL is a leading importer of trucks, buses, construction & mining equipment, generators and tools in Pakistan with a country wide after-sales support network. In addition to UD Trucks, VPL is also the authorized distributor of Volvo Trucks, Volvo Buses, Volvo Construction Equipment and Volvo Penta. VPL is part of the Panasian Group which has been responsible for the Volvo business in Pakistan since the mid-1970s.